« Motion Lotion: What’s the Commotion? 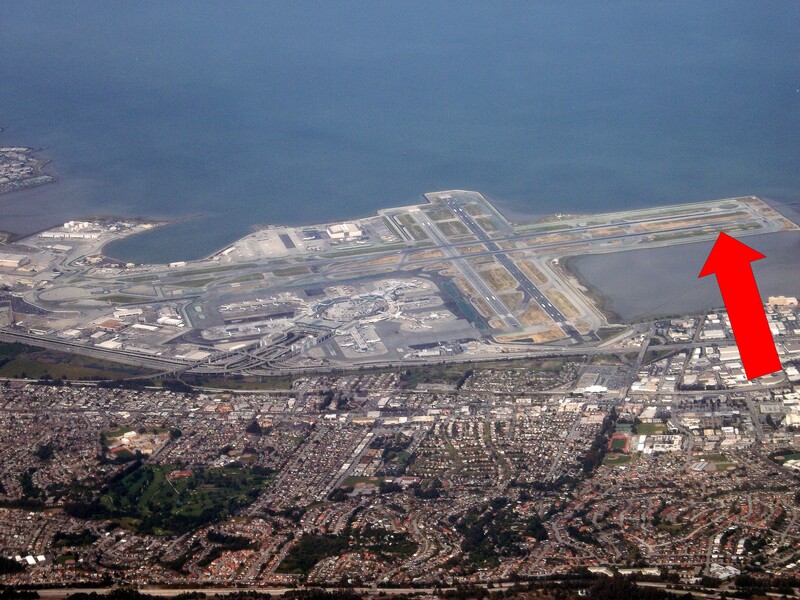 How do YOU land at San Francisco International Airport? Let’s talk about all of the runways at San Francisco International (SFO), because their are simultaneous operations on all four runways, so your landing runway is not operating independently or simply–nor are you as a pilot landing at SFO. Those two runways intersecting your landing runway will be launching aircraft out of SFO even as you are landing: yes, they’re crossing your runway–and you theirs–simultaneously. That means the SFO tower controllers are managing a complex ballet of speeds, timing and clearances. They’re doing a precise, excellent job, but a lot will depend on you: you must fly the assigned airspeed exactly in order for all of the moving parts in this synchronic mix of flying metal to mesh smoothly. Not taken with a telephoto lens. Rather, that’s a jet landing on 28L, taken from the cabin of one landing on 28R. Lateral separation is minimal–by virtue of a waiver of the standard separation that the FAA granted to SFO–so there are more restrictions on you, the pilot. First, you must not overtake the other aircraft. That’s because the trailing aircraft is charged with maintaining visual separation, because the leading aircraft can’t really see the trailing aircraft. If you overtake him, there will be a period where neither can maintain separation visually. So airspeed control must be exact, usually assigned by tower–to ensure separation from another part of the moving mechanism: aircraft are taking off on the intersecting runways, shooting the gap between your landing aircraft (and the parallel partner above) and the ones who landed before you. Here’s the instrument approach for your landing runway–and there’s a complication today with that, too. Today, the radio glidepath, or “Glideslope” (GS) is NOTAMed (NOTice to AirMen) out–meaning you will not have that descent guidance available on your display, so, you’ll be expected then to manually crosscheck the “step down” altitudes (7000, 6000, 5000, 4000, 3100, 1800, and 213) against the distance marked on this chart. All while flying the specified speed assigned by tower, which you must integrate with the maximum speeds allowed by the flap configuration required for the approach and landing. Sounding too complicated to manage? Well, it’s not. In fact, it’s routine: very often, you’ll encounter intersecting runway operations (Chicago O’Hare comes to mind, and those controllers do a fantastic job of choreographing that ballet); many airports have reduced, FAA-waived runway separation (hello, Minneapolis), and at any given time, airports around the nation report various instrument landing system components temporarily out of service . The glideslope being out wasn’t a surprise, either: you were advised by NOTAM (see above) before you even took off on this leg of the condition of the equipment and on your approach briefing (probably done within the last hour) you reviewed the requirements, procedures and complication with the other pilot(s) in the cockpit prior to starting the approach. And if you’re savvy, just in case, you briefed the approach to the parallel runway as well. That’s because at any point, due to traffic load or other factors, SFO tower can swap you to the other runway–just like that but again, that’s routine in the airline biz. Expect it, pre-brief it, deal with it. Fly the speed assigned to the waypoint assigned, maintain the altitude minimums according to the above chart by comparison with your distance from the field and . . . configure for landing, while observing the flap speed limitations of your jet. 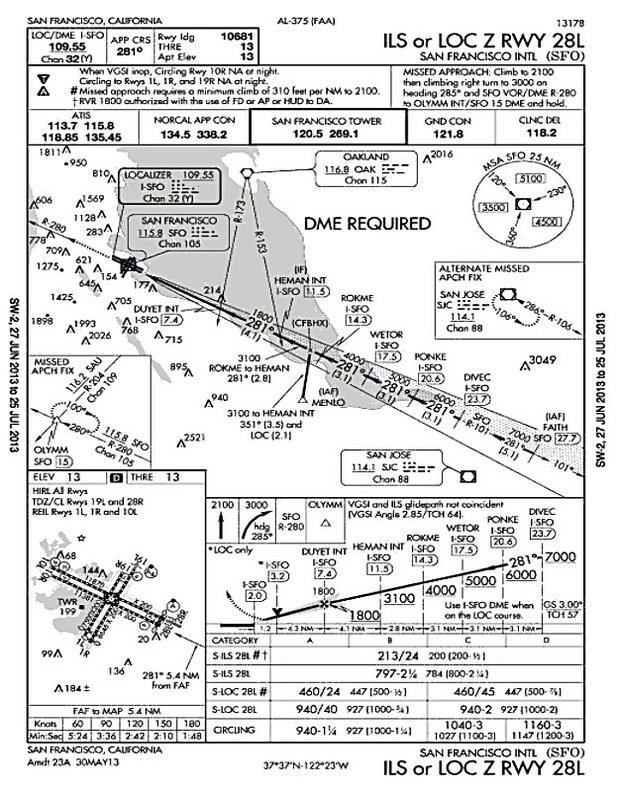 Here’s where you get to do your own balancing act within the swirling gearbox of approaches, landings, takeoffs and climbouts: if tower assigns you to fly a speed of 200 to “DUYET,” (see approach diagram above), that means you are limited to flaps 15 (have to be below 190 for more). But DUYET is at 1,800 feet and your airline has a “stabilized approach” policy below 1,000 feet: must be in final landing configuration and stabilized airspeed (neither increasing or decreasing) with a stable power setting (neither spooling up or down) from 1,000 feet to touchdown. Power control is key to airspeed. From 1,800 at DUYET to 1,000 feet, at a standard descent rate of around 800-900 feet per minute, you’ll have about 60 seconds, maybe less depending on tailwinds, to decelerate about 50 knots, then re-stablize the speed and power, and extend the flaps from 15 to 25 to 30 or 40 for landing. If not, mandatory go-around–meaning, initiate a climb following the “Missed Approach” instructions on the chart above. That’s also included in your approach briefing, remember which one–left or right–that you’re doing because remember, there are aircraft launching as well, mixing into the airspace. Then either repeat the approach (also very routine) or divert. Stabilized? Good–now the only thing YOU must do is monitor descent rate, speed and alignment. That’s why a stabilized approach is vital: being set in descent rate and airspeed and power setting frees you to simply fly to a safe landing. After an approach that you now know is anything but simple. Happy landings. 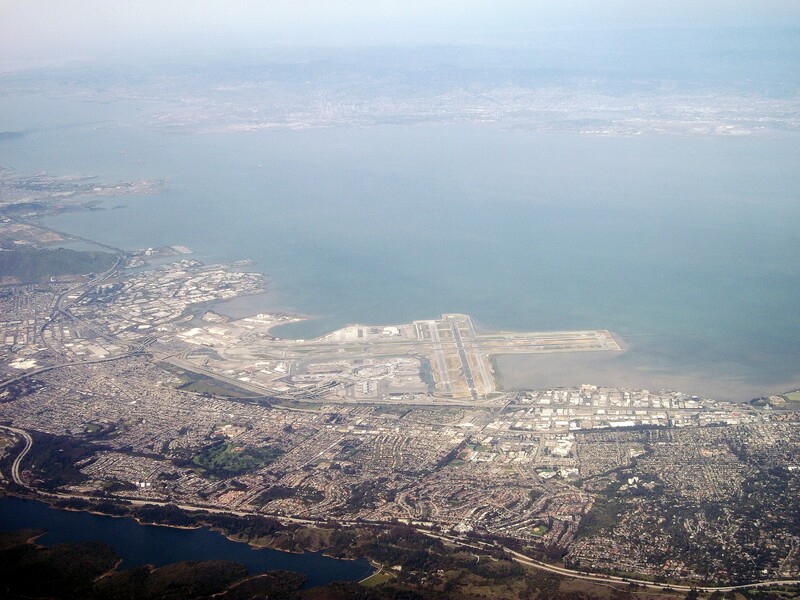 This entry was posted on July 9, 2013 at 12:16 pm and is filed under air travel, airline, airline pilot, airline pilot blog, airliner, airport, flight crew, jet flight with tags 28L and 28R, landing, landing at San Francisco International, parallel runways, San Francisco International. You can follow any responses to this entry through the RSS 2.0 feed. You can leave a response, or trackback from your own site. So how do you account for the Asiana pilot flying 12 knots slower than the recommended speed? With another very experienced pilot in his right seat? I really can’t account for that. But, with the NTSB poring over the flight data recorder, the aircraft, and the crew, I expect we’ll get solid answers in due time. I am a aviation junky how always wanted to be a pilot. Now I am 37 with one of those boring business desk jobs. =) Great blog and thanks for sharing! Same here Gerardo, same here! I know you’ve piloted a 747 into SFO and MSP many, many times, often with a guy doing his first landing in either the aircraft or at the airport. Heads up, always . . .
Captain Manno, I;ve been following you’re blog for quite a while and can’t imagine you sitting in the other seat watching the PF getting that low and slow without screaming your head off. And, they’d have to dry clean my seat cushion, too. But, should be no hill for a climber. I still am at a loss that with at least 3 crew (one jumpseat) in that cockpit, they couldn’t get a perfectly functioning aircraft onto an 11,000 foot runway in CAVU weather, but I wasn’t in those shoes to know what was being discussed or called out. Timely and topical, great blog Dr. Manno. I know, James, it’s a head shaker. And as you said, we’ll get good answers from the NTSB in due time. I know you folks on the flight deck are aviators, first and foremost, but with both safety and technological assistance and guidance both at an all-time high, don’t you think glideslope guidance should be expected/mandated at all times? It would seem unnecessarily difficult to stabilize a decent rate based on visual clues over water during hazy daylight hours when the PAPI is not exactly glowing at ya. Thanks for the great, and timely, post! Glideslope mandated? Not really. Many runways at major airports don’t even have any instrument approaches. The trend is to onboard landing guidance, such as VNAV or RNAV, which will give you a 3 degree glidepath all the way to touchdown on any runway–if you use it. Great post Chris. At busy, approach-critical airports with too-close parallel runways, (like SFO’s 27L and 28R, MSP and others, and were last minute runways changes are common, is there any advantage to programming one FMC for left and the other for right? Is it possible? Assuming that your bird is MEL-free (ha-ha), it seems that you’ve got a spare FMC for the approach. Can you explain a bit? Thank you, -C.
That’s actually a technique in less sophisticated FMS jets like the MD-80: you program 2 routes, one with the the 28 left approach, one with 28 right. Then you can just switch routes and the approach is there. Not so in the Boeing advanced FMS–they talk to each other. One route only. Nice post and good job of breaking down the approach. For all of us sitting here at zero knots, it is easy to know what happened and we are all reminded that controlled flight into the terrain isn’t the best way to land. One thing I haven’t seen mentioned in the media, is the cultural differences between Americans (Country not airline) and Asians. I imagine that there was a major breakdown in the CRM. I don’t know if it is an insult to tell the Captain to go around or to ask the LCA to take the airplane. But as far as I am concerned, this was a crew effort. Also, no one has mentioned that the airplane was talking to them the entire time. It should have been giving altitude reports and the Runway Awareness and Advisory System (RAAS) should have been talking the entire time too. At some point the Ground Proximity Warning System (GPWS) should have started yelling at them as well. Finally the stall system should have activated. Lots to think about. Again nice post. I’m not familiar with RAAS. The GPWS is inhibited fully configured and on a normal glide path. CRM? Most definitely, and cultural impediments to intervention? Absolutely. 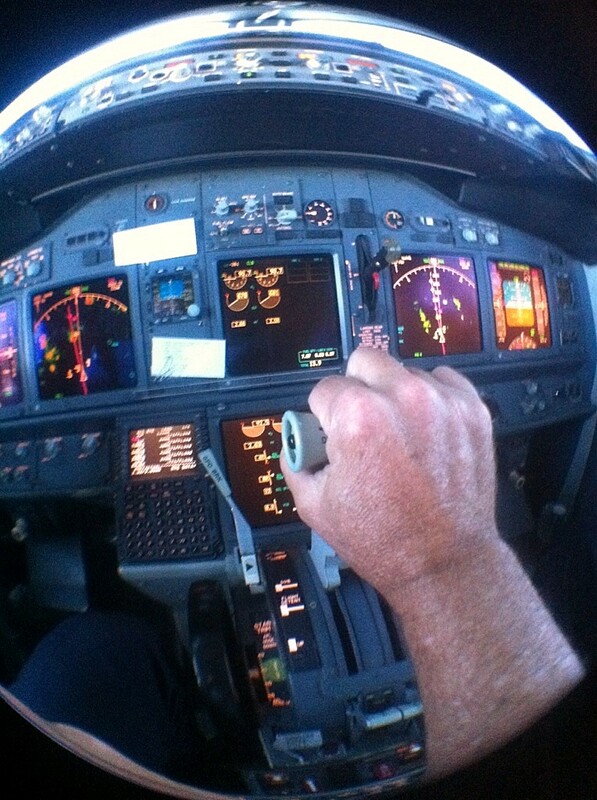 In American Airlines cockpits, if either pilot says “Go-around,” we sure do. We can talk about the what and the why at a safe altitude. The RAAS provides notifications about the runway that is being approached, distance remaining, and other nice to know items. It is not perfect, but it is a nice tool. On my airplane, it is tied into the GPWS and would give out warnings for an approach that was below a normal glide path. I would assume the guys at SFO were below GP. I brief my FOs that if they don’t have time to tell me to go-around or I don’t immediately respond. They must take the airplane and fly it away from the ground. At altitude we can talk about it. We don’t have RAAS on any of our jets. But we do have strong CRM! And it shows the fundamentals that went wrong. Perhaps the voice recorders will clarify what happened inside the cockpit but the pilots will have to explain a lot…. I agree with you, Martin–no one in the cockpit noticed or spoke up? Incredible. The investigation should give us good answers in due time. this is excellent info. I’m not a pilot, but wish I were! I just cannot understand how the trainer pilot allowed the trainee to get that low and slow. 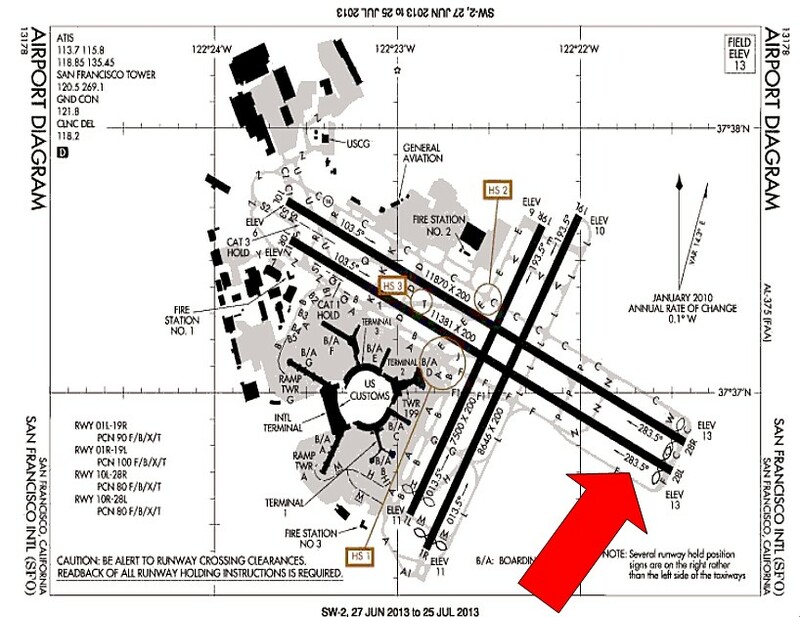 Nice post, it avoids conjecture but lists pitfalls…..
what is the pier looking thing in the bay that looks like it juts out from the runway on land? with posts all lined up? what do they use that for? Those are the approach lights. In low visibility conditions or at night, they help pilots line up on the runway. Since moving to the 737-800 from the MD-80, do you find it easy to become complacent as you have more technology to rely on? Do you think relying too heavily on the technology could have been a factor? I don’t, Tom, actually the opposite: if you’re fully integrated into the vertical and horizontal nav through the flight management architecture–what it intends, how it gets there, where it is in the algorhithm of speed, distance and descent–especially through the HUD (Heads Up Display), I feel more integrated into the jet and the flight path. If the aircraft were crossing each other’s runways simultaneously, that means they would collide at the intersection. I think you mean that the aircraft cross each other’s runways alternately. Traffic launches from the 1s, traffic lands on the 28s, and then the next aircraft launch on the 1s. Says the guy with a PhD in English. All I can say is my heart goes out to the family of the deceased and those hurt. Most people are saying that he was a trainee pilot and it was his fault but I’ve read that he had 8000 odd hours on another aircraft type and had flown to SFO 29 times before, the basics remain the same, on any aircraft! There’s never any substitute for hands-on, flying the jet. If you don’t, it’ll fly you–and everyone else on board. That usually doesn’t end well. Great post Chris! Some new information out today. Looks like the auto throttle was not engaged. Sounds like the crew thought it was, leading to the speed issue. Not sure how the A/T was off, I believe it’s standard to leave it in. Ugh. No matter what, where’s the cross check? And with a check airman? Jeez. Good post. I received an email from a retired O-6 this evening that included a forwarded email from a former US flag carrier standards captain. He was a sim instructor for several years at the airline of recent mishap aircraft, and later for its competitor. It seemed CRM and culture issues were (are) continuing systemic problems with those carriers, despite Class A accidents for both over the years. But perhaps this incident may be the one to finally change things. I have a copy of that email, too. Looks like cultural interference issues are breaking down CRM in some cases. Sad. At the end of the day, this was a simple VFR approach with two pilots managing speed, altitude and approach angle. The way most pilots land most planes under ideal conditions. One more note about the aircrew’s experience. Sitting idly while the autopilot flies builds a lot of hours, but it doesn’t build experience. Both pilots may have basically had the same hour of experience thousands of times, as they just rode the plane back and forth across the Pacific while the a/p did all the work. In other words, they have a lot of hours, but not a lot of airman/airperson experience to show for it. If SOP at Asiana is to always fly coupled approaches with vertical guidance, both pilots could’ve been completely unfamiliar with hand-flying even a VFR approach…. Dr. Manno, I may be wrong, but don’t most, if not all, US carriers recommend hand-flying every approach? I’ll take THAT experience over someone sitting in the cockpit letting the a/p fly approaches. Excellent post, Chris! Great explanation. I hope you don’t mind if I post a link here, but I did a vid of that approach too, with the ATC tapes, and an explanation of what’s going on during the crash. By the way, heads up, on my next blog I’ll be posting cartoons I’ve done…with a nod at the end of it to your cartooning prowess, LOL! Actually, I didn’t take that video, I found it on YouTube (notice the props in the shadow near the end of the video?). That’s because to take a video on landing is prohibited at my airline (sterile cockpit and all that), so besides being fired for taking video and posting it on YouTube, it seems unprofessional to be doing that in flight. Agreed. Whether it a Boeing, Cessna or ultralight, it all comes down to situational awareness: power, pitch, airspeed, altitude. We only autoland when the clear zone is protected, and that’s only < 200 foot ceiling. Otherwise, we don't autoland and here's a new one (at least I was surprised by it): we NEVER autoland on the 737-800. 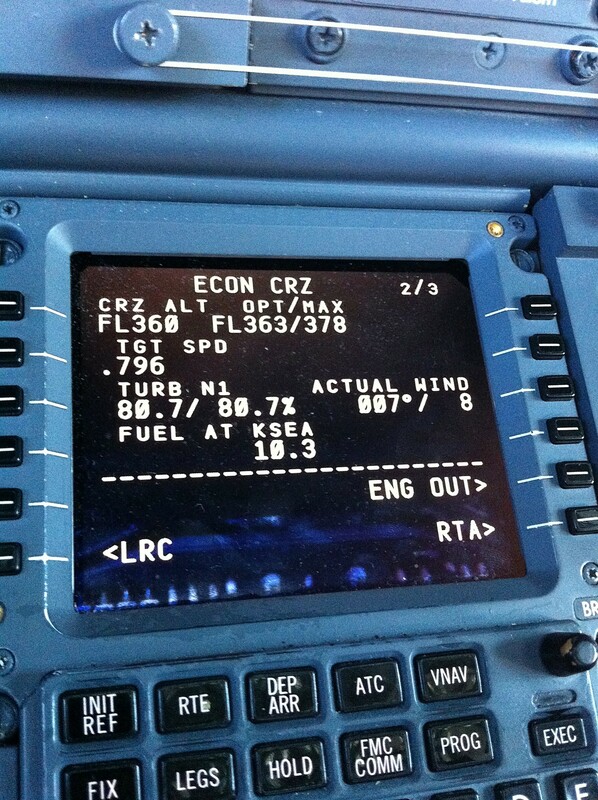 Cat 3 down to 50' is hand-flown in the 737. I use the automation guidance fully–while hand-flying. 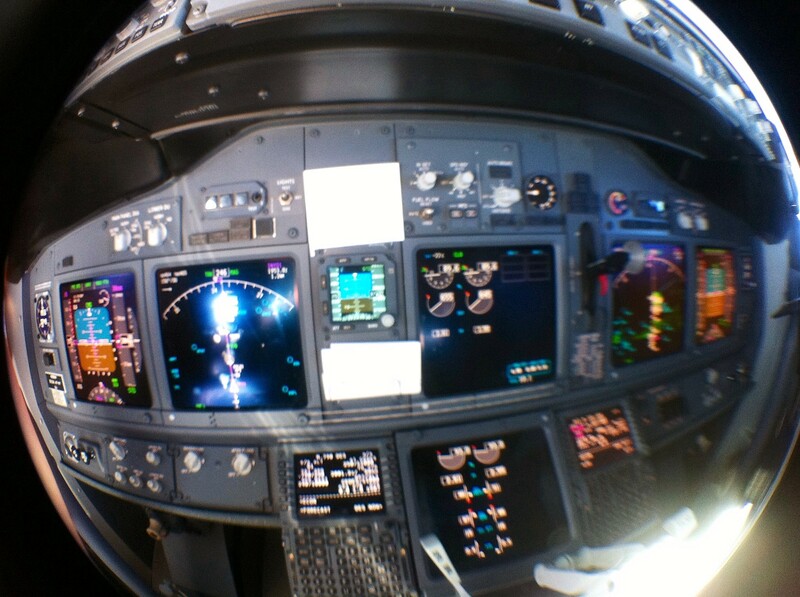 Airspeed and altitude are always foremost in my mid, even looking through the cosmic HUD. You are right–no substitute for hands-on flying. I found your blog a few weeks ago, and I’ve been learning so much. Despite being a physicist and knowing why I don’t have much to worry about, I’ve always been an uncomfortable flyer. I find the more I learn about what’s going on up front, the better I feel. Thanks for helping me out. One question: you talk about the stabilized approach below 1000 feet being airline policy. Does the airline check you out on that with data from the plane/groundstations or is it left to you and the F/O to manually provide details in reports? I’m sort of wondering what kind of external microscope airline pilots are under besides getting everyone back on the ground in one piece (what I care about) or ticking off air traffic control? Or related, but not exactly the same, hypothetically let’s say that Asiana plane was from a US based airline but that the pilots were able to get on the ground safely (either on this approach or by coming around again). What would happen to those pilots? Thanks again, this was very informative. Actually, the jet datalinks all of the approach parameters–speed, altitude, descent rate, configuration, power settings–on every approach to our central databank in the tech department. Each is automatically screened and any exceedance of parameters is flagged and investigated. As pilots, that means you will be called to account for anything other than a stabilized approach. Most major US passenger carriers have the same system, and the pilot unions support the program. I sure do: there’s no room in our ranks for anything but complete compliance. Not sure what goes on with non-US flag carriers, even operating on US soil. Don’t know. But the NTSB has all of the data and evidence to answer that in due time. A minor quibble. You say that the final step down altitude is 213 but I don’t think that would be true if the GS is OTS. As for the tragic crash at SFO, I’m going to do the cardinal sin of premature speculation. I suspect that we saw the consequences of inadequate training in basic airmanship (the interrelationship of pitch, angle of attack, power and airpeed) combined with cultural characteristics that demand high levels of deference to one’s superiors (i. e reluctance to tell the captain that he is low and slow on final). Even on a LOC, we’d fly RNAV, but even on the VASI, for a standard 3 degree glide slope I’d expect to cross the point at 213. As for speculation, I expect the NTSB will have factual data and conclusions in due time. Great article. Landing in SFO seems like a tricky process. I am currently training for my instrument rating, but I hope to someday land a airlines into SFO. To me this seems to be pilot error. I know nothing is absolute yet, but that is what I deduce. I have read several places that the Asian airlines have pilots that are not very competent in hand flying their planes. I’ve done crash investigation in the Air Force, after completing aircraft accident investigation training at USC. I’m fine with a wait-and-see, because often, things aren’t as simple as they might seem. I don’t know near enough to speculate about this thing. I am interested (living in Minneapolis) about runway separation. I checked on Google Earth, and the SFO runways are separated by just less than 800 feet. The MSP parallels are separated by something like 3300 feet. Are the procedures the same in the two? What’s the FAA mandate for runway separation? I don’t know what the FAA spec is for runway separation. What I do know is that in many cases, the FAA sets standards, then promptly grants waivers on an individual basis. Kind of makes sense, because there’s really no “one size fits all” when it comes to airports and aviation. But it sure complicates the job for pilots. Hi Chris, an excellent read on what is ultimately a sad event. There’s a lot of speculation floating around but amongst it all some interesting facts, one of which is that the Boeing and Airbus auto throttles operate in different ways. I’m no pilot, but apparently the Boeing throttles move when armed and in operation whilst the Airbus ones do not. I also read in relation to the Air France A330 that crashed in the Atlantic a few years back that movement of the Airbus sidesticks is not replicated between the left and right sides whilst on Boeing aircraft movement of the control yoke is replicated. With many airlines, Asiana amongst them, operating mixed Boeing and Airbus fleets, and the junior pilot having, according to reports, transitioned from the A320 to the 777, maybe its time that manufacturers are mandated to have primary systems that operate in the same way? Of course, all of this is of little use if CRM breaks down, but it could at least remove one factor from the equation. BTW – Congratulations on the doctorate! The larger problem in this case, like in AF447 that you mentioned, is situational awareness. Whether the throttles move or not, you have to have an awareness of what power is required and what power is set. This is especially true for the check airman (that’s what we call instructor pilots). Even if your trainee in either seat is from the Airbus fleet transitioning to Boeing, you are personally responsible for assuring that the correct flight management mode is in use and the proper N1 power setting is being produced. Which again comes back to situational awareness. I’ve been a check airman; often it’s like flying solo, because new or transitioning pilots will normally require a period of adaptation and familiarization. That’s expected–but the check airman still must assure safe altitudes, modes, speeds, descent rates and intercepts no matter what. I personally prefer a jet where flight controls and throttles move–Boeing!–for all the reasons you mentioned. Plus, in my opinion, the Boeing 777 engineering and airframe construction saved lives that day: an Airbus would have come to a stop in 17,000 small pieces. Many procedures in medicine are like landing a plane at an international airport. You have to learn “how” to perform the procedure safely, know the complications and obtain informed consent. If any of these things go wrong, well, the Asiana flight at SFO comes to mind. Enjoy this post by a very articulate airline captain who explains how to land and San Francisco International Airport. Use it to think about how you perform procedures. I have turned my husband onto your blog. He is getting his pilots license, he has been flying a Katana DA-40 I think that’s the name of the plane. I,on the other hand am scared to death of flying. I do not like turbulence. I live near KBNA and have to fly to KBUR to visit family,and I’m so scared to fly I won’t even go visit my family anymore. Funny how my hubby and I are polar opposites when it comes to flying. I knew my hubby loved flying when in 1987 or 1988 he had a American Airlines poster taped to the wall that had a pic of a jet and the words ” The on time machine” printed on the poster. Anyway, thanks for your blog. My hubby and I enjoy reading it. ive read that there have been instances of planes landing on 1L or 1R though very rare. I checked on airnav.com and found no charts for these runways. Are they still used for landings on rare occassions? I’ve never seen it, and there’s just no maneuvering space to the south or east. At least jets would have a tough time landing on the 1s. This shot is from 2008, and I didn’t take it, but yes, 01 is used for arrivals at times. http://www.flickr.com/photos/45000502@N04/4834001964/ –the photographer has several shots of jets landing on 01. Cap’n, thanks for the explanation of what ‘maintain visual separation’ actually means. 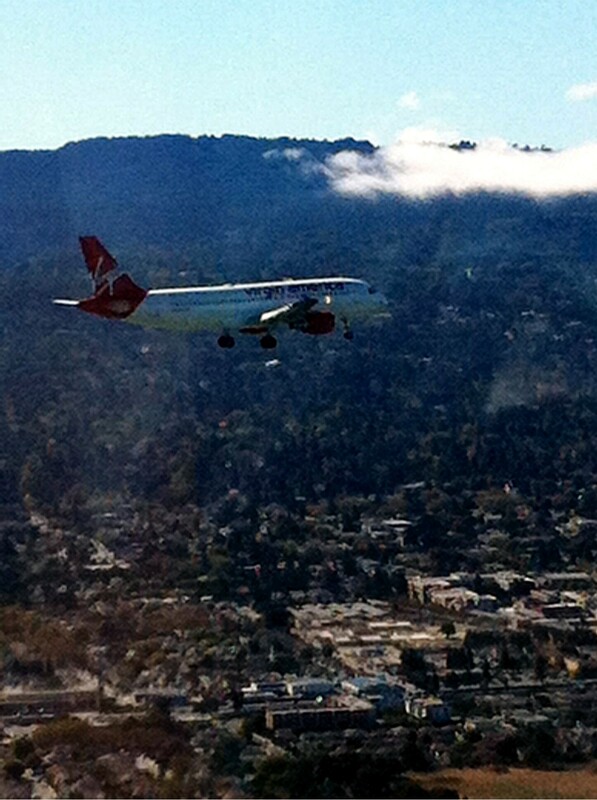 I’ve heard it many times listening in on UAL’s channel 9 coming into SFO. Knew that we would have simultaneous landings, but didn’t think about the ‘whoever is ahead needs to stay ahead’ ramifications of it. Interesting and great pics. Looks like the ever-tricky visual approaches to 33 in BUR and 26 in ABQ (the ABQ approach warns you that high terrain intersects a 3 degree glide path). Always a challenge, especially at night. Another comment. Asiana’s accident caused more than a few diverts since SFO’s longest runway was closed. Lufthansa 454 diverted to OAK, becoming the 1st A380 to land there. After being on the ground for a few hours, it took off on a ferry flight, OAK-SFO, flying 79 miles to cover a straight line distance of only 12 miles. As if all that weren’t enough, the A380 landed on 18 when it got to SFO–probably another first ever. That flight crew has a few stories to tell. Actually, the 380 could land on 28L or R; they diverted because SFO was closed after the crash to protect the emergency response crews. You really don’t think before you click send, do you? If you want to find out who was flying, just click on the YouTube video and all the info is there. Wasn’t me, obviously. You are really a simpleton: every embedded video wasn’t taken by whoever embedded it. I’d have to disagree on your comment that if it were an Airbus the plane would be in 17,000 pieces if anything AWE1549 and a few nasty runway overruns showed that they can hold themselves really well under the most punishing conditions. As a ground staff member I’m really thankful that the doors on Airbus disarm automatically if opened from the outside unlike in the 737 which would help us assist in an evacuation if it seems like no one inside the airplane is responsive.